Yeah, nicer cover photo I’d say than my edition – the green-ish one with a sort of “rough”, grainy photo of you on it Bruce! Just started the book, although my wife bought it for me for Christmas (I’m so behind in my reading!). PS – “Girls Talk” is one of my favorite songs. Honestly. I love your bass work on it and also enjoy Edmunds and Lowe’s version and even Linda Ronstadt’s version. I always thought that was a gem that got lost in the shuffle of the times. Take care. Sad that George Martin checked it in, but also about one of his famed studios. Yes, a lovely chap. You know there was once talk of him playing James Bond! He would’ve been perfect. That island certainly took a battering. But I believe he and his wife Judy went back there and built a cultural centre for everyone. Yes, he would have. Sean Connery was the best in my opinion. See another one dropped today, Keith Emerson. Better keep your eye out for banana peels. I had a ELP phase, ’74-’75 era. I always enjoyed Greg Lake’s work. Saw them in ’78. Palmer had like 9 thousand tom-toms. Difficult to enthuse about them overmuch, once you kne the Clouds story. Our friend Dave Dawson/Derek Philpott is doing an podcast with Andy Duke about Clouds this weekend — and there’s a possibility that Clouds’ organist, Billy Ritchie, may now tell his story too. I’ll make sure I post any links. It’s like when they said they were going to get rid of ‘classic’ Coke. That is an ultra cool tie! I had a bit of a penchant for spotted ties at the time. You can bet your life that it didn’t cost more than £1 or $1 from a thrift store. Happy Paddy’s Day! Here’s a newly posted video of a EC & The A’s appearance in Ireland. Appropriately, a lens flare from the camera makes it look like there is a pick superimposed on the left of the frame during that song. A pink pick, at that. After the festival they were all sent to Borstal for destroying that fence. No offense, and sorry to hit your wallet, but I just listed my first edition copy for sale on Amazon. If it’s any consolation, the used ones are going for nearly as much as the new ones. Like a fine car, a good book holds its value. But let’s face it, it’s not a re-read it kind of book. I will apply the net $15 I receive towards this. 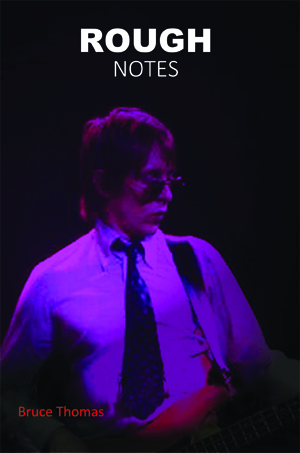 When I read the book, that story made me laugh out loud…and made me wonder what you would have done for “Heart Shaped Bruise” if you had been there for the ‘Delivery Man’ tour! 😉 Nice new cover pic, and the perfect anecdote for it. You should send copies to Rolling Stone, Mojo and Uncut for some fresh reviews and new buzz. You’d have to find a color that rhymed with EC for that line to work on stage.